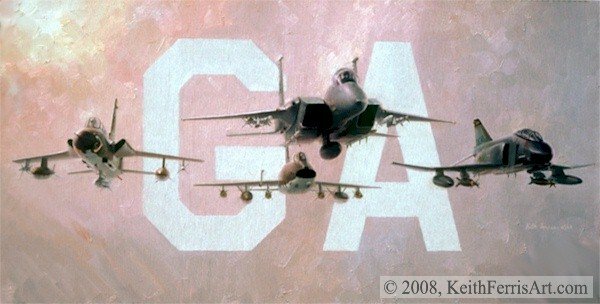 For over two decades the Georgia Air National Guard's 116th Fighter Wing flew some of the finest fighter aircraft of their times. It was equipped with the F-100D tactical fighter from 1973 to 1979, the F-105G defense suppression "Wild Weasel" aircraft from 1979 to 1982, and the F-4D strike aircraft with laser guided weapons from 1982 to 1986, when the wing's 128th Fighter Squadron received its F-15A Eagle Air Superiority Fighters. These were flown at Dobbins Air National Guard base until the 128th stood down as a fighter unit in the mid 1990s.